In recent years, coneflowers have become one of the most popular hardy perennials in the landscape, with new hybrids introduced each year, much to the delight of gardeners. Behind the coneflower craze is the patriarch of the family, the native purple coneflower, Echinacea purpurea. This drought-tolerant robust perennial needs little introduction, as its name and flower are instantly recognized by gardeners and non-gardeners alike. The medicinal properties of Echinacea are well-documented and Echinacea is a common herbal drug used to ward off colds and flu by stimulating the immune system at the onset of symptoms. The closely related Echinacea angustifolia was widely used to treat serious diseases such as tuberculosis and diptheria prior to the introduction of modern antibiotics. 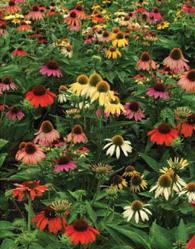 Whether grown for ornamental or herbal value, coneflowers are a great addition to the garden. Give them a sunny spot with well-drained soil and they'll reward you with plenty of blooms.